In my last blog, I discussed the trends leading to the re-invention of buildings. In this blog, I will discuss how buildings can become optimized by translating data into meaningful insights. For the most part, buildings today are still conceived in under-optimized ways, with many disparate systems, multiple networks, silos across systems, and various issues of data availability – far from delivering customer value. In order to achieve these results, we need to translate data into actionable insight. This is where technologies like Schneider Electric’s EcoStruxure can help us. EcoStruxure is an open innovation platform approach that is truly different. It offers openness, scalability and future-readiness. In our platform, we focus on connecting many devices and different types of IoT sensors so that we gather relevant data from multiple sources. 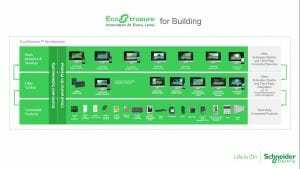 EcoStruxure for Building starts at the connected products level with Schneider Electric’s award-winning connected products and/or other third party connected products. It provides integration, monitoring and control capabilities at the edge control level, and leads the way with applications, analytics and services enabling informed decision-making. With the EcoStruxure platform, we are putting together a true data highway with architectures that are full IP. We are making integration within our OT system and across OT systems- like fire systems, security systems and BMS– intuitive and easy. Partners and integrators, such as our EcoXperts, can freely leverage our Smart Connectors using published SDKs and open APIs. Plus, our platform offers one single backbone for buildings, so that partners can use it everywhere and customers can have a similar experience in New York and Bangalore. This is true scalability. The cloud-based platform is open, flexible and exposes data in a friendly/usable structure. This enables collaboration with innovative start-ups that may need the data to deliver value to buildings users. Overall, with our platform, users can gather data easily and at massive scale as well as integrate data from various OT systems. With its structure and organization, the data is easily available so that we can provide analytics and applications to drive superior insight and actionable outcomes helping users get the best of their buildings. More Engaging: We help create more engaging buildings- buildings that offer a comfortable environment for occupants, that help make them productive and ultimately turn into engaging places to live and work. Hyper-Efficient: We enable new levels of efficiency. We call it hyper-efficiency. Hyper-efficiency goes beyond the gains coming from traditional automation. It gets a boost from connectivity, big data and analytics. Truly Sustainable: We also help create truly sustainable buildings- buildings that have a limited carbon footprint. Truly sustainable buildings optimize energy efficiency. Always Simple: Finally, we help create simpler buildings- buildings that are easier, faster, cheaper to install. This brings value to our partners and ultimately to the full value-chain. To discover how EcoStruxure Building can help deliver value to you and your employees by turning data into actionable insights, visit our site or come back soon for my final blog in the Re-Inventing Buildings series where I will discuss how smart buildings deliver business value. If you like this blog, you may enjoy other blogs under the building management topic.